The BDSCP program is comprised of 15 vendor-neutral Big Data course modules. Training is available via private and public on-site and virtual workshops and self-paced Study Kits and eLearning video subscriptions. The BDSCP program contains 15 exams. Arcitura exams are available at Pearson VUE testing centers around the world, as well as via Pearson VUE Online Proctoring. Exams can also be proctored on-site as part of Arcitura-delivered workshops. 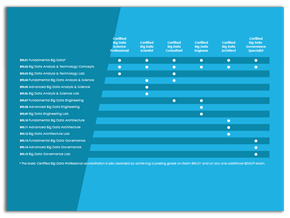 The BDSCP program offers 7 vendor-neutral Big Data certifications. Each certification is achieved by passing a different combination of BDSCP exams. Some exams count toward multiple certifications. The Big Data Science Certified Professional (BDSCP) program from Arcitura is dedicated to excellence in the fields of Big Data science, analysis, analytics, business intelligence, and technology architecture, as well as design, development, and governance. A collection of 15 courses establishes a set of 7 vendor-neutral industry certifications with different areas of specialization. Founded by best-selling author Thomas Erl, this curriculum enables IT professionals to develop real-world Big Data science proficiency. Because of the vendor-neutral focus of the course materials, the skills acquired by attaining certifications are applicable to any vendor or open-source platform. Big Data concepts, techniques and practices, learn about the mature and proven parts of the Big Data industry, become recognized as an accredited Big Data professional, better assess commercial and open source products and services offered in the Big Data market and be assigned project roles and responsibilities suitable for skillsets proven by their certification. The Big Data Science Certified Professional (BDSCP) program offers 6 certification tracks, each dedicated to a specialized field of practice within the Big Data industry. Visit the BDSCP Matrix page for an overview of the certification tracks and their associated BDSCP courses. Use this matrix to plan your path to accreditation! Big Data Governance Study Kits Coming Soon! No commitment pre-order options with discounts available.